The work centres on Bond Street Underground Station, and reflects the underlying codes and conventions of behaviour that maintains an order in the way people move in relation to each other, so that the required order contrasts with the seeming chaos of the situation. Each of the four groups of panels in Going Home is sited at a different moment in the journey through the station: the entrance from the street, the booking hall, the descending escalator, and finally, the platform. 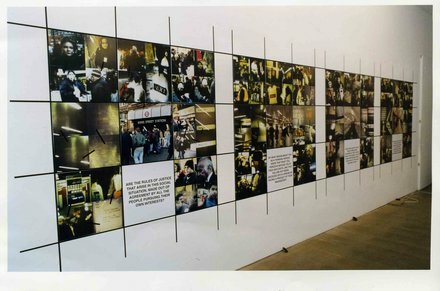 Each location has an associated question concerning issues of perception and society formed from four ideas considered key to the history of Western philosophy, and the surrounding panels are made up of images drawn from information around that location alongside audio tapes of the sounds from there. 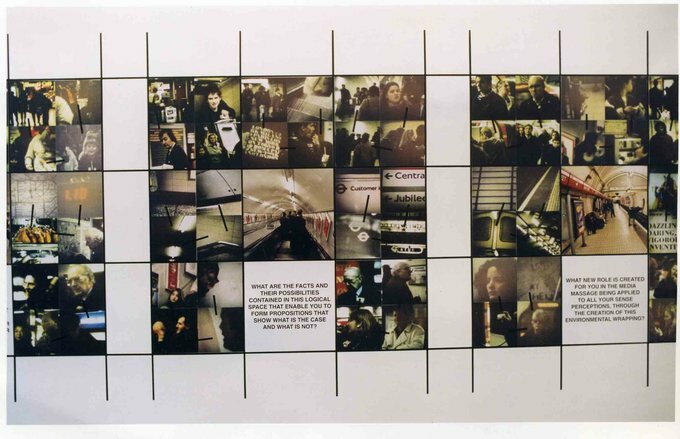 These information images are stills from films made by a group of art practitioners who agreed to take part in an event at Bond Street Station, where they each recorded different facets of their experience in trying to board a tube train in the rush hour. The involvement of this group reflects the diversity and relativity of our social perceptions, but the involvement of these other people in the documentation used in the work, also brings into question the issue of authorship in the origination of a work of art. The aim here being to reflect that a work of art is not actually the product of any one person, but the result of society between people and that the society surrounding a work of art is the key factor in giving it meaning and validation, both during origination and then in reception. Going Home recognises the richness and variety of exchange between people, the issues of unique authorship and the social reality of cultural origination and the role of philosophy in underpinning the development of our social perceptions and values. The four philosophical questions posed to the viewer demonstrate the prevailing contemporary culture of individualism and possession of objects. To engage with these questions the viewer is invited to enter a symbolic world - that of the transient, fluid, multichannel reality of going on this journey – through the images and sounds of the journey home.